Evett has loved the idea of working hands-on with animals ever since she was young—she and her family kept everything from dogs and rabbits to fish, birds, chinchillas, and reptiles! When the opportunity arose to join a compassionate, hard-working team of animal-care professionals, she didn’t hesitate. Now, Evett cares for the pets and animal owners of the area as a Veterinary Assistant. 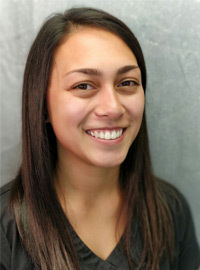 Evett is a Minnesota native and currently studies veterinary technology at Argosy University. She plans on becoming a Licensed Veterinary Technician in the near future! She was happy to supplement her studies with real-world experience by joining the Golden Valley Animal Hospital family in January of 2017 as a Kennel Attendant—it wasn’t long before she learned even more and became a Veterinary Assistant. When she isn’t studying or tending to pets’ needs here at the hospital, Evett enjoys hiking and backpacking, camping, hunting, fishing, snowboarding, and dabbling in drawing and photography. She and her partner, Trevor, share their lives with two pets: a dog, Millie, who loves to spend time outdoors; and a mischievous cat who goes by Miles.